The European aristoracy was fascinated by antler furnishings at the beginning of the 19th century. Marvellous creations decorated their hunting castles and manors. Unfortunately many of these unique furnitures pieces have been destroyed or are considered as lost. Pictures are the only remaining evidence of the beauty of these decorated rooms. 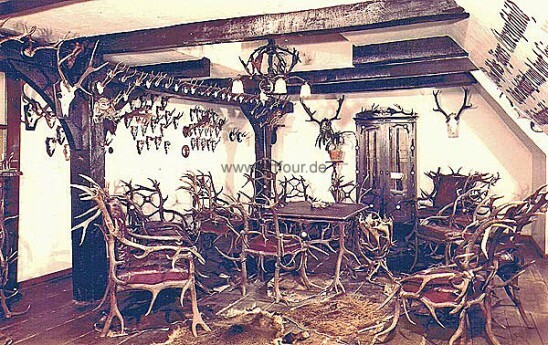 Imagine a beautiful country residence decorated with a complete furniture from the stag, deer, fallow deer or furniture pieces ornamented with carved horn roses, wild boar tusks and horns from ibex or chamois? This dream feels like travelling to a different period of time, back to the 19th century. Besides of rare collector pieces only pictures, drawings and aquarlles are left from the destructions of the wars in the 20th century. Today artfour presents historical pictures of castle arrangements. Enjoy your trip to the past and fancy of wandering around those generous rooms.